Indigo Summer keep going from strength to strength with every release they put out. 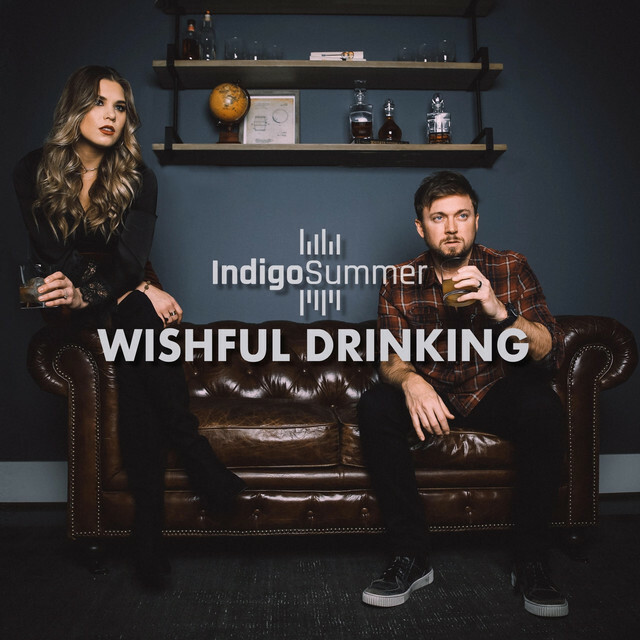 With their debut self titled album being released on Itunes last year, Indigo Summer return with a new single, not on the album Wishful Drinking. Wishful Drinking is a delightful mid tempo track with a quaint vintage feel and a slight jingle that for some reason reminds me of Christmas. The old styled melody to this song has a real sharp blues edge blended with a down tempo 50’s rock and roll sound and then some country twang that brings the tempo up a bit. This song shows how diverse this duo can be – if you listen to their music you will notice a wide range of styles from catchy country pop to sophisticated country ballads to this old styled cinematic tune. Bryan and Hope’s voices seem to have a stronger relationship with this song, they were near perfect before but it seems like they have really got to know each others vocals now which have not only brought stronger harmonies but have complimented each others vocals in such a way that individually their voices are now much more polished and richer. Indigo Summer are a duo that I have said time and time again and will continue to preach as such, that they deserve to be heard, they deserve recognition and all the success and I sure as hope that an incredible career is coming their way that will last for years to come. The idea for “Wishful Drinking” really came from a guys’ night. I was sitting around with some buddies drinking some bourbon when, naturally, the conversation turned to the women in our lives. One of my friends made a comment about how he wanted to get back together with an ex-girlfriend of his. And as soon as he said it we were all like, “Yeah right man, that’s never going to happen” ‘cause we knew how bad he messed it up. And then one of us said “That’s some wishful drinking.” And that’s pretty much how I got the idea for the song. I immediately put the title in my phone, researched to see if that title had been written yet, and when I saw that it surprisingly hadn’t, believed I had a special song waiting to be written. But that’s just how life is sometimes: The truth is rarely what you want it to be when you’re heartbroken, one way or another. And that’s what this song is about. “Wishful Drinking” is the first release that is not from a previously recorded album, so when I went to produce it, I had a vision for bringing our sound into a new place. All of the songs and production on our debut album were at least 2 years old and a lot has changed in music since then. While I absolutely love our first album, I was excited to do something new, that would stretch us a little bit. I started out by eliminating the standard process of going to a studio to record the song with studio musicians. I hired an amazing programmer, Tony Esterly, and only one studio player, Wes Little, to do drums. Everything else was created by myself, my best friend, Mark Lonsway, and Tony. The goal was to take a heart-wrenching, traditional, six-eight time, country ballad, and transform it in to a relevant-sounding track that both our county-music-loving fans and pop-loving fans would fall in love with. I am really proud of it and cannot wait for everyone to hear it! The second I heard this song I was so excited to record it. I love that this single gave us the opportunity to bring a stronger side of our vocals to the table. ‘Wishful Drinking’ has a blues feel to it, but still stays true to our sound. I love this track and I hope our fans will enjoy seeing this side of us.